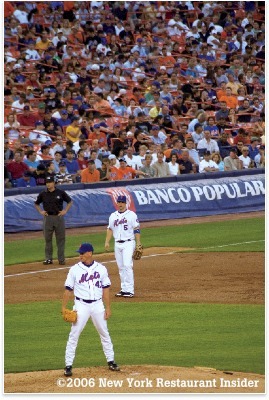 On opening day at Shea Stadium this past April, Aramark, the company that handles food service at the Queens home of the New York Mets, served 26,000 hot dogs, 3,700 bags of peanuts, 7,500 orders of chicken tenders, 4,000 sausage and pepper sandwiches (yow! ), and 10,000 gallons of soda. While serving that amount of food may seem like a monumental task, Shea’s two restaurants, The Diamond Club and the Sports Club together average about 1000 covers a night. Even though the Diamond club is perceived as an exclusive restaurant open only to select fans, Assistant General Manager Chris Blumlo says that fans with a normal ticket can usually get into the restaurant on most nights if they call ahead. 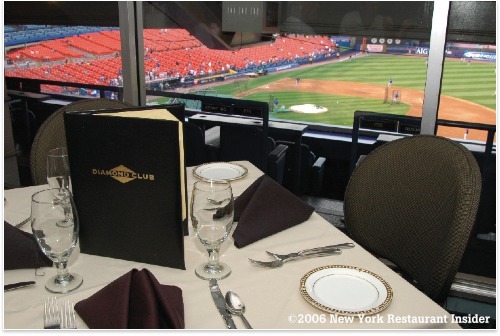 Although the experience is a bit dearer than a dog and a soda, the view combined with the cuisine of the Diamond Club, where NYRI dined for a recent home game, is well worth it. 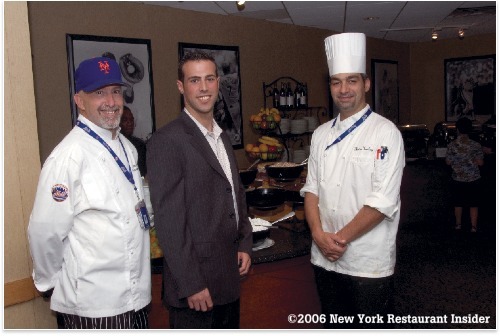 Blumlo, a native of Boston, came to Aramark at Shea in 2002 from Restaurant Associates. His responsibilities at RA included Cafe Manager at Bertelsmann Music Group in the Business & Industry division before being transferred to RA’s Restaurant Division, where he was dining room manager at Naples 45 and the Rock Center Summer Garden. His challenge at Aramark was to help upgrade the cuisine at the stadium’s two restaurants using his experience in the restaurant industry. He brought in a new executive chef, Flavien Trichery (originally from France, most recently from the Cosmopolitan Club, and a soccer fan who is still trying to learn about the rules of baseball), introduced some fresh ideas, and has made the Diamond Club restaurant a real destination spot for people with high expectations. It also doesn’t hurt that the Mets are in first place and on their way to the playoffs. But Blumlo and his associates don’t get to see many games. “The Diamond club shuts down after the 2nd inning,” says Blumlo, “but the Sports Club stays open until an hour after the game. This place remains busy though, as some people have their dinner and just stay by the window and watch the game from there. 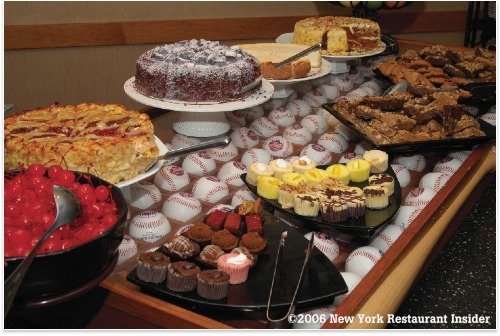 The setup at Diamond club is a high-end buffet, but the quality of the food would rival many high-end Manhattan restaurants. There is a fruit and salad area, a sauté area, an imported and domestic cheese area, a meat carving area, an entree area with chicken, meat, and fish, and a dessert station. Across the hall, the Sports Club is a sit-down restaurant with menu items typical for a sports bar. I asked Blumlo what he does in the off-season, expecting to hear that he took several months off in the winter. No such luck. 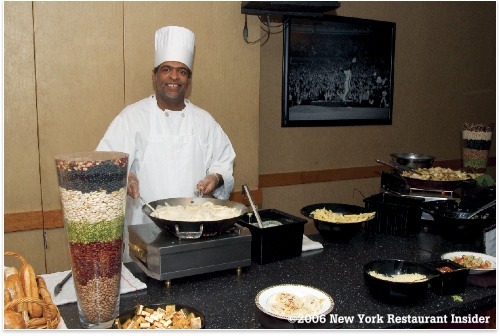 Aramark also has a year-round cafeteria so they can serve meals to the Mets front-office staff who work year-round. They typically spend November and December doing menu development and completing any construction work, such as re-designing kitchens areas or upgrading equipment. Then, the fun begins yet again, early in the year. While the turnover among kitchen staff is high, a typical scenario for any restaurant, many of Aramark’s premium service employees are extremely dedicated.